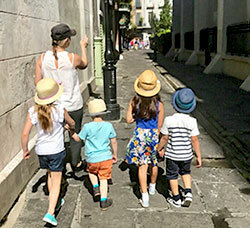 Discover how family-friendly the French Quarter can be with French QuarTours, offering four unique experiences designed especially for kids between the ages of 5 and 18. 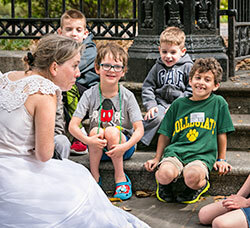 Our teacher-led adventures will capture and maintain child's attention while offering up tidbits of New Orleans history most adults will find fascinating. Travel back in time to 19th century New Orleans on this hands-on French Quarter walking tour. Hear about the kids who skipped down these cobblestoned streets 200 years ago – children both free and enslaved, American and. Creole, male and female. The strange, the icky, the good, the bad – this tour has it all! 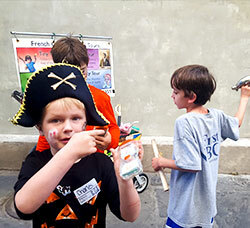 Take a kid friendly ghost hunt in the French Quarter. Seek out legendary spirits like the pirate Jean Lafitte and the voodoo queen Marie Laveau. Take a peek under the veil of mystery that has surrounded our city’s history for more than 300 years. On the Teen Tour, an adaption of the Creole Kids Tour for tweens and teens, you’ll discuss things as trivial as how women in Old New Orleans wore their makeup to important subjects like the War of 1812 and slavery. Find out what maps looked like before Google, what kids did for fun before YouTube, and much more. Learn about – and listen to – some of our greatest musicians in New Orleans. Visit the sites where the legends were born, and take a deep dive into the history behind the music. All tours are 90 minutes long and cost $20 per person. Kids 4 and under are free. French QuarTours also offers tours for school and other groups. 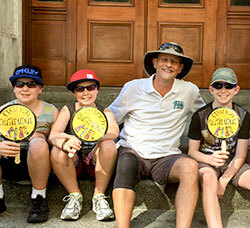 Ask about their private family tours.